David Kelly was supposed to die at age 6. Over the course of his life, Kelly waged a 14-month-long battle with bladder cancer, had his gallbladder removed—along with two feet of his lower intestine—and contracted diabetes. Now 73, Kelly has been defying the doctor’s diagnosis for decades. Kelly moved to Lake Tahoe from Los Angeles 30 years ago, and over his time in the Basin has facilitated the creation of three housing developments for seniors and disabled residents. He counts South Lake Tahoe’s Tahoe Senior Plaza, Kelly Ridge and Sky Forest Acres—an 18-unit neighborhood for people with disabilities—among his life accomplishments. Kelly is also one of the founding members of the Tahoe Area Coordinating Council for the Disabled (TACCD), a South Shore–based nonprofit organization that advocates on behalf of Tahoe’s disabled population. Pillsbury serves as TACCD secretary, writing letters to districts that have yet to bring their buildings up to code, per the accessibility requirements set forth in the Americans with Disabilities Act (ADA)—a 26-year-old piece of legislation that Pillsbury says has fallen short of its original intentions. The ADA’s ambitious goals include the removal of discriminatory barriers to housing, employment and transportation for the country’s disabled citizens. The trouble with the ADA’s mission is that the majority of people largely never witness or experience disability. Unless closely connected to a disabled person, it’s difficult to comprehend the challenges they face on a daily basis. “One of the problems with Tahoe and people with disabilities is that Tahoe is not used to seeing a lot of people with physical impairments. Buildings here were built a long time ago, and they’re not accessible,” Pillsbury says. According to the 2014 Tahoe Regional Housing Needs Program Report, only 14 percent of Tahoe’s housing was built after 1990—the year President George H.W. Bush signed the ADA into law. It’s no wonder, then, that a majority of Tahoe homes and buildings do not meet federal accessibility requirements. The high cost of construction, permitting fees and a laborious development process exacerbate the issue. With redevelopment agencies shuttered in California, transforming Tahoe’s old housing stock has become even more of a challenge. When the Tahoe Senior Plaza, Tahoe’s only assisted living facility geared to adults 62 and older, opened in 1999, it already had a ten-year waiting list. “If you apply when you’re 62, you don’t get in until you’re 70,” Pillsbury says. According to Pillsbury, a “senior tsunami” is on its way. Aging baby boomers are growing older, and in the next decade many are expected to retire. The Tahoe Prosperity Center (TPC) released the revealing “Measuring for Prosperity” report in October 2015, highlighting Tahoe’s affordability gap. “The interesting thing is that we saw the first population increase in 65 and older in almost 20 years. So we know that the aging population is here and growing,” says Heidi Hill Drum, TPC’s executive director. The report revealed a 5.2 percent increase in the adult population over 65 since the 2000 census. California and Nevada have seen 1 and 1.5 percent increases, respectively, in this demographic over the same period of time. “I think it’s an interesting issue, and in addition to affordable housing, senior housing is something that we should be addressing, especially with the increase in senior population,” says Drum. 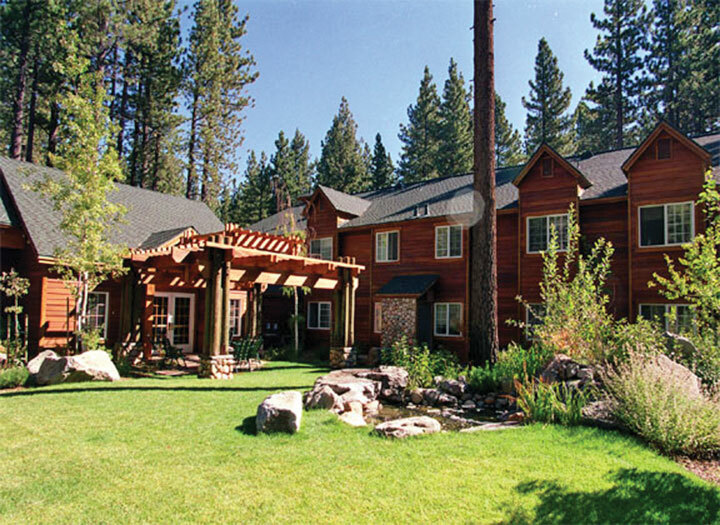 The Tahoe Senior Plaza is currently Tahoe’s only assisted living development for older adults. Kelly considers the project to be one of his crowning achievements. Admittedly, he says, he spends a bit more time there than either Kelly Ridge, which bears his name, or Sky Forest Acres. Kelly credits his supportive family, including his wife Coco—who counsels developmentally disabled residents at Tahoe Senior Plaza—for his continued resilience in the face of illness. A new family member has strengthened his resolve even more—his 8-month-old granddaughter McKenzie. Kelly describes a particularly moving moment at Tahoe Senior Plaza’s 2015 Christmas party. A man who had been on the waiting list for five years had recently moved in and was reluctant to join the party. Prior to moving in, Kelly says, the man resided in a “fleabag” motel. A series of phone calls and a stroke of luck helped track the would-be resident down.